Dr. John Warner arrived in DeWitt County in 1842, practicing medicine until 1856. Shortly before the Civil War he went into banking and accumulated a fortune. A few months before his death December 21, 1905, Dr. John Warner announced he would erect a structure for hospital services and donate it to the public. His will provided for construction of the hospital. Work was begun and the building completed in 1906. The building stood idle four years as there was no money for maintenance or for furnishings. The hospital came under City of Clinton ownership in 1909 and remains city-owned today. In the spring of 1910, a proposition to levy a two-mill tax on Clinton property was submitted to a vote and carried by a gratifying majority. Public support for the hospital has been a long-standing part of its heritage. The original structure cost approximately $25,000 and was built of pressed brick, with buff Bedford stone trimmings and was practically fireproof. There were 25 patient rooms, a reception room, and a large hall off the main entrance. On the third floor, the operating room was located immediately under the roof where the light was perfect. The first patient was admitted January 20, 1911. 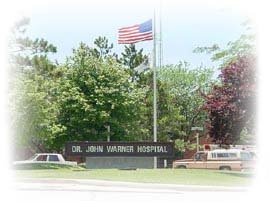 In spite of several additions, Warner Hospital & Health Services had outgrown its building and the year 1970 heralded the opening of a new wing. The modern facility we have today was completed in April 1978 and incorporated the wing built in 1970. In 1999, a new Medical Office Building was completed which houses the hospital’s Rural Health Center now known as Family Medicine. Today, Warner Hospital & Health Services is a fully accredited Critical Access Hospital (CAH). The hospital currently has more than 150 employees, making it one of the major employers in DeWitt County. 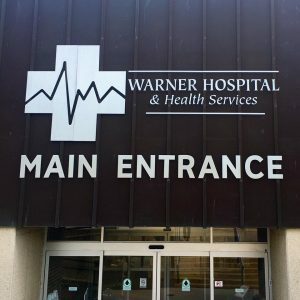 Visit Warner Hospital on the web at www.warnerhospital.org or checkout their Facebook page. Copyright 2013, City of Clinton, Illinois | All Rights Reserved.